Jan lived an intensive, rich, fascinating and thrilling life full of passion. In spite of the fact that he died at the age of 65 he lived a life loaded with memories and experiences enough for at least a 200 year. A distracted loss for all those people and friends worldwide who love classic cars and automotive history. For sure his life was dedicated to the automobile with a true passion. He considered the automobile a starting point in many developments the world went through since the 19th century: the automobile opened the world, created improved transportation, also over the borders, influenced our cultures, lifes and economy drastically and turned out to be a source of pleasure and satisfaction for anyone who loves travelling or racing. Jan had a strong desire to preserve this important heritage for posterity. In 1989 he sold his shares to focus on his true passion: old automobiles. It is clear that he inherited this passion from his father who managed to buy his first classic car in 1961 after years of searching. In 1993 Jan opened the Deventer Automuseum, a museum and showroom at the same time, with selling in mind, exhibiting his permanent and floating collection of exclusive collectors cars. He considered buying and selling exclusive classic cars to be a very personal affair. Selling and also buying was often a matter of granting. His customers understood that selling a car to Jan always resulted in a real good home for their cherished possession. His clients became friends and a friendship with Jan easily lasted forty years or longer. In 1999 Jan initiated and co-founded the Concourse d’élégance Paleis het Loo in Apeldoorn. His intention was to create an automotive happening along the same lines as the world famous Pebble Beach Concourse in the U.S.A. A true festivity strictly reserved for automotive enthusiasts and purists. There was no end to the excitement of the most beautiful and exclusive classic automobiles that were shown by the owners while a fancy dinner in great style and a kind of Son et Lumière spectacle all added together to the quality of this unforgettable event. Every year Jan managed to attract a top high quality and matchless collection of classic cars to be brought in from all over the world. It was not a happening for the general public but strictly meant for bringing true car freaks together. It turned out to be a great happening of a unique quality and intimicy, year after year. We learned that when Jan had a strong belief in his ideas he was prepared to risk his neck. He researched all possibilities, went on and on, finding the correct solutions in order to realize the targets he aimed at. In 2003 the Deventer Automuseum moved to Joure in Friesland. His collection of vintage and veteran cars and the unique collection of automobilia, spares, rare books, journals and breath taking vintage posters got a new home. The new premises was the famous old factory of ‘Douwe Egberts’, truly a location with the qualities of a museum. He had a strong preference for the French designers of the thirties and forties, for special coachwork (his speciality) and also for pre 1905 motorcars. He attended the London Brighton Veteran Car Run quite a few times and was a most respected participant. An early start in London -generally reserved for the oldest cars- guaranteed most publicity but Jan preferred to do it otherwise. He took the departure as one of the very last, driving his powerful FIAT 24/32 from 1904 to arrive as one of the very first! In 2015 his arrival at Madeira Drive in Brighton was in 10 hours and 08’, only 5 seconds after the number one arriving competitor. This was the fastest time of arrival ever of his FIAT. It was also going to be Jan’s very last Veteran Car Run. 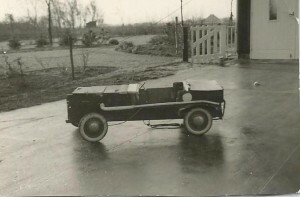 Jan was always searching for hidden away and original automobiles, preferably with special coachwork. Literally every journey started and ended in his extensive library. In between his library studies he was negotiating on a hidden Talbot, discovered in Servia, while sitting in a cramped Trabant, parked along the curb… Or he discussed a rare and valuable FIAT of an ex-general or was involved in buying a complete collection of Bugattis, Ferraris or Rolls Royces, somewhere around the world. Jan was always busy to dig deep into automotive history. Many of his friends contacted him over the years searching for information, chassis numbers, car history and so on. Together with his friends he often discovered quite a few barn finds bringing important cars into the light of day. It is surprising to notice the number of his ‘discoveries’ being exhibited in museums and in private collections all over the world today. It is not easy at an early stage to give a comprehensive answer to this question. Our business, called Style & Auto as it is known today, will continue her activities. For sure. We stock rare spare parts, fabulous historical books, magazines and other automobilia and also intend to continue selling rare motorcars. Our family, now without Jan, will cater for the important heritage that he left to us. It is our duty and honour to maintain and continue what Jan once started with all his experience, heart and soul. Jan and I still have young children, Dapper (15) and Sterk (12). From a former marriage Jan has two children, Tim (29) and Marlies (31). Together we call for your help to share with us in writing what your most valuable memories and experiences with Jan are. You may recall specific automotive activities or adventures that you like to share with us; all these will contribute to the lasting memory of his beautiful personality, always full of passion. Jan was also a great father to his children and together we regret his demise so very much. Later, when the children will be grown-up adults, they will better understand who their father was and what kept him so much involved in the classic, vintage and veteran motorcar world. Therefore I am pretty sure that they will thoroughly enjoy reading about the adventures of their father in the automotive scene, all edited by you. We thank you for your willingness and support and look forward to your comments, letters or calls! Jan Bruijn (1951) studied industrial design at the, now called, Design Academy in Eindhoven, the Netherlands. During and after his study he worked for the automotive industry for fifteen years as management consultant in long term brand marketing. In 1989 he decided to sell his shares of his consultancy company and concentrated on his passion, old cars. In 1993 he initiated Automuseum Deventer with a selection of about 30 cars on exhibition as well as several cars for sale. This initiative was followed in 1999 by creating the Concours d’elegance Paleis het Loo in Apeldoorn which was an instant success, the first edition had works back up entries with a Mercedes ‘Silberpfeil’, Auto Union and Alfa Romeo 159 Grand Prix cars. The imagination of a 9 year old boy. Jan’s first 4,5 ltr. Bentley. After three editions the Concours Event was sold. And in 2003 the museum moved to its new location in the northern part of Holland in the former Douwe Egberts factory. No longer a museum but a gallery instead with a vast library of automotive books and magazines. Visits by appointment only. Jan considers cars of the fifties and sixties as quite modern, and while there is nothing wrong with modern cars he concentrates himself on the older ones, personal favourites are pre 1905 cars, eligible for the annual London to Brighton Run. 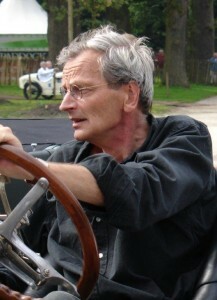 Jan Bruijn at the wheel of the 1916 ex-Addison Brown, ex-Paul Freehill, ex-Colin Crabb Stutz Bearcat. Research and chasing cars all over the world resulting in smashing barnfinds is his main occupation and it is surprising to note how many important cars are now to be found in major important private collections and museums all over the world. So, if interested in a rare pre-war car why not contact him and discuss the possibilities.